No need to mix or stir the primer, buy or clean an applicator brush. No need to wait for the fusing primer to dry between shelf coatings. Just cut PAPYROS to shelf size, place on the shelf, insert into the kiln and start firing! A single layer of paper will prevent glass from sticking to the shelf at full fusing temperatures. PAPYROS is porous, allowing air to circulate. This reduces the probability of air bubbles from forming between the glass and kiln shelf. When shelf primer is applied unevenly, glass may stick to bare or unevenly coated areas during expansion. When this happens, glass can pull apart and break. PAPYROS ensures an even coat between the glass and kiln. 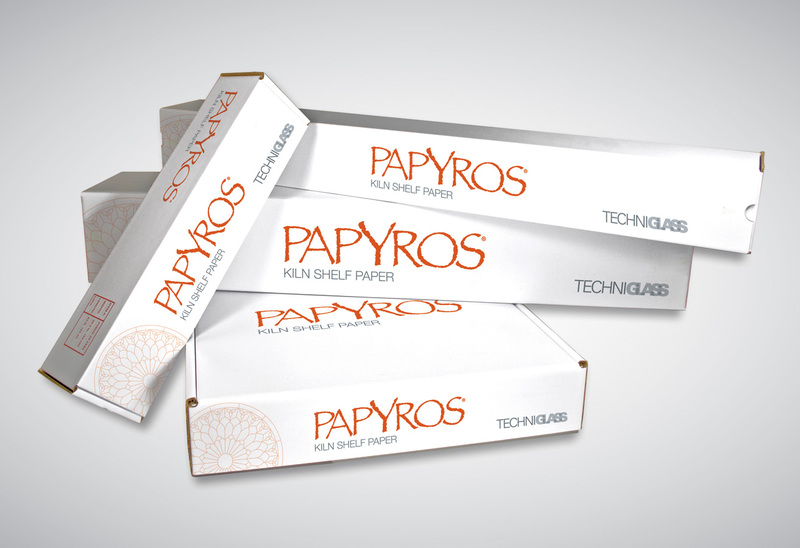 PAPYROS protects and prolongs the kiln brick shelf life. PAPYROS is quite durable, and tends to retain its paper-like qualities during firing, rather than decomposing into loose dust. This allows for fast and easy clean up. Available in a wide range of sizes and formats for the hobbyist or professional artist. Cut Sheet a minimum of 1/2″ (13mm) larger than the glass piece. Place sheet on kiln shelf, then place piece of art directly on PAPYROS. Fire art in usual way. Once glass has cooled, remove it from the shelf. If necessary, rinse off paper residue with water. Line the entire shelf, or cut a piece of PAPYROS measuring at least 1/2″ larger than your project (on all sides), then place your glass project(s) on the papered shelf and fuse as you would normally. When you’ve decided that you’re ready for a new piece of PAPYROS, follow the Safe Handling instructions listed below to dispose of the expired paper. NOTE: If using a Shop Vac, ensure that your HEPA filters are changed on a regular basis so vacuum functions correctly. When using a trash basket, make sure you use one dedicated for paper disposal that has a fitted lid and is lined with a plastic bag. Empty trash bags on a regular basis. Avoid breathing residual dust when cutting pre-fused PAPYROS, or cleaning post-fired PAPYROS from your kiln shelf. Wear a respirator that is NIOSH-approved for dust when working with PAPYROS. Wear safety glasses with side shields.